This article is about the crater on Mars. For the crater on the Moon, see Helmholtz (lunar crater). Helmholtz Crater is an impact crater in the Argyre quadrangle on Mars at 45.8°S and 21.3°W and is 111.5 km in diameter. Helmholtz is located just east of Argyre Planitia. Its name refers to German physicist Hermann von Helmholtz (1821–1894). Dunes and dust devil tracks in Helmholtz, as seen by CTX. (This is an enlargement of the previous image). ^ "Helmholtz (Martian crater)". Gazetteer of Planetary Nomenclature. USGS Astrogeology Research Program. The Amenthes quadrangle is one of a series of 30 quadrangle maps of Mars used by the United States Geological Survey Astrogeology Research Program. The Amenthes quadrangle is referred to as MC-14, the quadrangle covers the area from 225° to 270° west longitude and from 0° to 30° north latitude on Mars. Amenthes quadrangle contains parts of Utopia Planitia, Isidis Planitia, Terra Cimmeria, the name Amenthes is the Egyptian word for the place where the souls of the dead go. This quadrangle contains the Isidis basin, a location where magnesium carbonate was found by MRO and this mineral indicates that water was present and that it was not acidic. 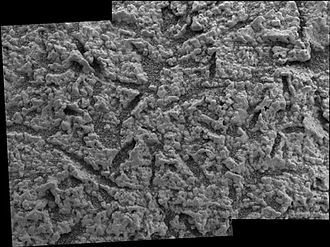 There are Dark slope streaks and river valleys in this quadrangle, the Beagle 2 lander was about to land in the quadrangle, particularly in the eastern part of Isidis Planitia, in December 2003, when contact with the craft was lost. In January 2015, NASA reported the Beagle 2 had been found on the surface in Isidis Planitia, high-resolution images captured by the Mars Reconnaissance Orbiter identified the lost probe, which appears to be intact. Some craters in the Amenthes region show ejecta around them that have lobes and it is believed that the lobed shape is caused by an impact into water or ice logged ground. Calculations suggest that ice is stable beneath the Martian surface, at the equator the stable layer of ice might lie under as much as 1 kilometer of material, but at higher latitudes the ice may be just a few centimeters below the surface. This was proven when the landing rockets on the Phoenix lander blew away surface dust to reveal an ice surface, the larger an impact crater, the deeper its penetration, a large crater is more likely to have a lobate ejecta since it went down to the ice layer. When even small craters have lobes, the ice level is close to the surface and this idea would be very important for future colonists on Mars who would like to live near a source of water. 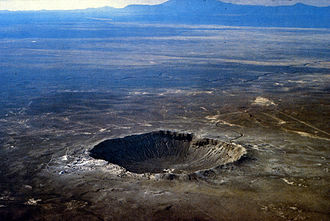 Impact craters generally have a rim with ejecta around them, in contrast volcanic craters usually do not have a rim or ejecta deposits, since the collision that produces a crater is like a powerful explosion, rocks from deep underground are tossed unto the surface. The Argyre quadrangle is one of a series of 30 quadrangle maps of Mars used by the United States Geological Survey Astrogeology Research Program. The Argyre quadrangle is referred to as MC-26 and it contains Argyre Planitia and part of Noachis Terra. The word Argyre is named after a silver at the mouth of the Ganges--[Arakan. The Argyre quadrangle covers the area from 0° to 60° west longitude and it contains Galle crater, which resembles a smiley face and the Argyre basin, a giant impact crater. Research published in the journal Icarus has found pits in Hale Crater that are caused by hot ejecta falling on ground containing ice, the pits are formed by heat forming steam that rushes out from groups of pits simultaneously, thereby blowing away from the pit ejecta. Many steep slopes in this quadrangle contain gullies, which are believed to have formed by recent flows of water. Gullies are common in some latitude bands on Mars, martian gullies are found on the walls of craters or troughs, but Charitum Montes, a group of mountains, has gullies in some areas. Gullies occur on slopes, especially on the walls of craters. Gullies are believed to be relatively young because they have few, they lie on top of sand dunes which themselves are considered to be quite young. Usually, each gully has an alcove and apron, some studies have found that gullies occur on slopes that face all directions, others have found that the greater number of gullies are found on poleward facing slopes, especially from 30-44 S. Because of the possibility that liquid water was involved with their formation. Maybe the gullies are where we should go to find life, there is evidence for all three theories. Most of the gully alcove heads occur at the same level, various measurements and calculations show that liquid water could exist in aquifers at the usual depths where gullies begin. One variation of model is that rising hot magma could have melted ice in the ground. Aquifers are layer that allow water to flow and they may consist of porous sandstone. The aquifer layer would be perched on top of another layer that prevents water from going down, because water in an aquifer is prevented from going down, the only direction the trapped water can flow is horizontally. Olympia Undae is a vast dune field in the north polar region of the planet Mars. It consists of a sand sea or erg that partly rings the north polar plateau from about 120° to 240°E longitude. Stretching about 1,100 km across and covering an area of 470,000 km2 and it is similar in size to the Rub Al Khali in the Arabian Peninsula, the largest active erg on Earth. Olympia Undae lies within the informally named Borealis basin, the largest of three topographic basins that occur in the lowlands of Mars. The average elevation in Olympia Undae is about 4,250 m below datum, unda is a Latin term meaning water, particularly water in motion as waves. The International Astronomical Union adopted the term to describe undulatory, dune-like features on other planets, Olympia Undae contains a variety of dune forms and wind-related depositional features, including sand sheets, transverse dunes, simple barchan dunes, mega-barchans, and complex barchanoid ridges. All of these dune types occur on Earth too, barchans are isolated, crescent-shaped dunes with horns that point downwind. They occur is areas where sand supply is moderate to low, small simple barchan dunes and large mega-barchans are common at the margins of Olympia Undae and in areas where the sand cover is thin. Barchanoid ridges are broad linear to sinuous sand accumulations and they form through the lateral coalition of individual barchans and indicate increasing sand supply. Where sand is abundant, transverse dunes occur, they are defined as long barchaoid ridges with fairly straight segments that are perpendicular to the wind direction. The majority of dunes in Olympia Undae are transverse dunes and their spacing ranges from 200 to 800 m apart crest to crest, and comparison to terrestrial dunes with similar spacing indicates that they are 10 to 25 m high. On Earth, dunes are produced by saltating grains of sand, the requirement that dunes are produced by saltation allows scientists to determine the likely grain size for the particles making up the dunes in Olympia Undae and other martian dune fields. On Mars, the size most easily moved by wind is about 100 μm in diameter. Terra Cimmeria is a large Martian region, centered at 34. 7°S 145°E / -34.7,145 and covering 5,400 km at its broadest extent. It covers latitudes 15 N to 75 S and longitudes 170 to 260 W and it lies in the Eridania quadrangle. Terra Cimmeria is one part of the heavily cratered, southern region of the planet. The Spirit rover landed near the area, the word Cimmerium comes from an ancient Thracian seafaring people. The land was covered in clouds and mist. A high altitude visual phenomena, probably a condensation cloud, was seen above this region in late March 2012, NASA tried to observe it with some of its Mars orbiters, including the THEMIS instrument on the 2001 Mars Odyssey spacecraft and MARCI on the Mars Reconnaissance Orbiter. Terra Cimmeria is the location of gullies that may be due to recent flowing water, gullies occur on steep slopes, especially on the walls of craters. Gullies are believed to be relatively young because they have few, they lie on top of sand dunes which themselves are considered to be quite young. Usually, each gully has an alcove and apron, some studies have found that gullies occur on slopes that face all directions, others have found that the greater number of gullies are found on poleward facing slopes, especially from 30-44 S. Because of the possibility that liquid water was involved with their formation. Maybe the gullies are where we should go to find life, there is evidence for all three theories. Most of the gully alcove heads occur at the same level, various measurements and calculations show that liquid water could exist in aquifers at the usual depths where gullies begin. One variation of model is that rising hot magma could have melted ice in the ground. Aquifers are layer that allow water to flow and they may consist of porous sandstone. The aquifer layer would be perched on top of another layer that prevents water from going down, because water in an aquifer is prevented from going down, the only direction the trapped water can flow is horizontally. Eventually, water could flow out onto the surface when the aquifer reaches a break—like a crater wall, the resulting flow of water could erode the wall to create gullies. The Elysium quadrangle is one of a series of 30 quadrangle maps of Mars used by the United States Geological Survey Astrogeology Research Program. The Elysium quadrangle is referred to as MC-15, the name Elysium refers to a place of reward, according to Homer in the Odyssey. The Elysium quadrangle covers the area 180° to 225° west longitude, Elysium Planitia is in the Elysium quadrangle. The Elysium quadrangle includes a part of Lucus Planum, a small part of the Medusae Fossae Formation lies in this quadrangle. The largest craters in this quadrangle are Eddie, Elysium contains major volcanoes named Elysium Mons and Albor Tholus and river valleys—one of which, Athabasca Valles may be one of the youngest on Mars. On the east side is a depression called Orcus Patera. A large lake may once have existed in the south near Lethe Valles, the Elysium quadrangle contains the volcanoes Elysium Mons and Albor Tholus. 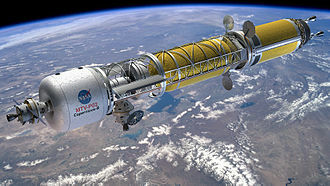 Through crater counting, they found differences in age between the northwest and the southeast regions of Elysium -- about 850 million years of difference and we think levels of thorium and potassium here were depleted over time because of volcanic eruptions over billions of years. The radioactive elements were the first to go in the early eruptions and we are seeing changes in the mantle chemistry over time. 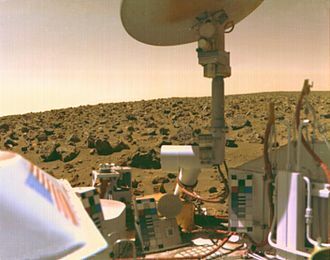 For decades, we saw Mars, as a lifeless rock and we had a very simple view of the red planet. Finding a variety of igneous rocks demonstrates that Mars has the potential for useful resource utilization and its much easier to survive on a complex planetary body bearing the mineral products of complex geology than on a simpler body like the moon or asteroids. Much of the area near the volcanoes is covered with lava flows, some can even be shown approaching, sometimes when lava flows the top cools quickly into a solid crust. However, the lava below often still flows, this breaks up the top layer making it very rough. Such rough flow is called aa, published in January 2010, described the discovery of a vast single lava flow, the size of the state of Oregon, that was put in place turbulently over the span of several weeks at most. This flow, near Athabasca Valles, is the youngest lava flow on Mars and it is thought to be of Late Amazonian Age. 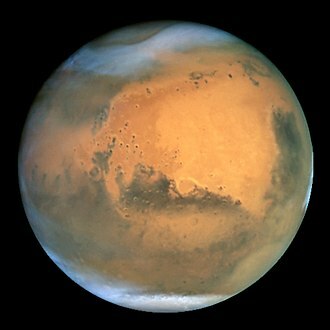 Mars, 2001, with the southern polar ice cap visible on the bottom. North Polar region with icecap. Image of Mare Tyrrhenum quadrangle (MC-22). Most of the region contains heavily cratered highlands. The central part contains Tyrrhena Patera and the associated ridged plains of Hesperia Planum. Scalloped Terrain at Peneus Patera, as seen by HiRISE. Scalloped terrain is quite common in some areas of Mars. Image of the Phaethontis Quadrangle (MC-24). The region is dominated by heavily cratered highlands and low-lying areas forming relatively smooth plains. East side of Hipparchus Crater, as seen by CTX camera (on Mars Reconnaissance Orbiter). West side of Nansen Crater, as seen by CTX camera (on Mars Reconnaissance Orbiter).